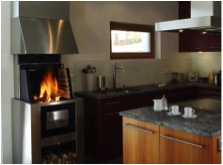 If you’re lucky enough to be designing your own dream designer kitchen, or just looking for inspiration to renovate the one you have, one of the best ways to create a cosy, welcoming kitchen that people will gravitate towards is to have a fireplace installed. With modern technology, you can install a fireplace almost anywhere. Just call out a professional for a consultation and discover the possibilities! 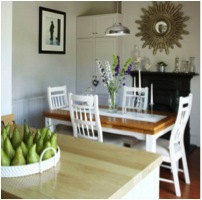 For a real touch of traditional style in a farmhouse kitchen, a beautiful brick built fireplace can be perfect. Not only does it keep the kitchen warm and toasty to welcome your family and friends – but also, if the fire box is big enough, it could easily hold a cast iron kettle or pan, letting you cook in a traditional way. If you have an open plan kitchen and dining area, or if you’re kitchen leads into the dining room, a double sided fireplace can really integrate the two rooms, making it a much more sociable space. 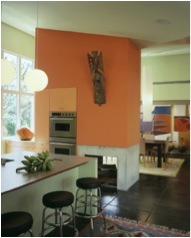 And, of course, you get the added benefit of heating two rooms with one fire making it wonderfully energy efficient. If you have a more modern kitchen, but would still like the luxury of a real fire, you could choose a functional but stylish fireplace that also provides an alternative method of cooking. A fireplace like this, set at counter height, will inspire new ways of cooking and will create a really distinctive feature, enhancing any kitchen. If you have an open plan kitchen and diner, a fireplace will really help to create an intimate and cosy dining experience. So, if you host dinner parties, or simply enjoy making the most of family meal times, a fireplace could be the ideal contribution to your dining area. 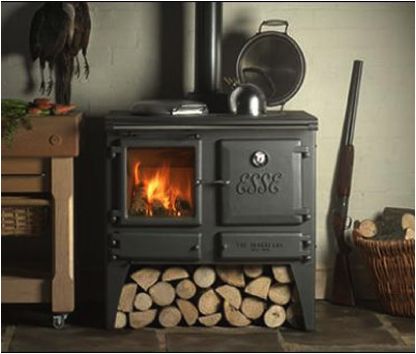 If you really prefer traditional cooking methods, rather than gas or electric ovens, a conventional wood burning stove could be your perfect kitchen solution. It combines the cosy, comforting feel of a real fire with a traditional stove and also provides a cost effective and energy efficient way to heat your home and hot water! There are a whole host of functional, beautiful and efficient fireplaces, perfect for any kind of kitchen. But to ensure you get the one you get what you want, always discuss your plans with a professional! The type of flue you have, or the kind of fire you want, could limit your choices so for more inspiration or to discuss your ideas further contact the fireplace experts at Enviro-Flame.